By 2015, when there will be something like 5 billion people connected around the world, where applications will predominate in the internet and there is broadband everywhere, a multitude of business models will exist. A vital aspect for communications service providers (CSP) to survive and thrive in this environment is to have a sharp focus on the individual needs of subscribers. CSPs, particularly mobile operators, already know a lot about their subscribers. They know not just who their customers are and what their service profile is, but how much they spend on the services, when and where they spend and much, much more. Few other industries have such detailed insight into their customers’ behavior. Using this information efficiently and effectively will be the ultimate enabler of success. The trouble is, all this data is often locked away in fragmented databases and on legacy data management platforms. Because of the way networks have evolved over the years, subscriber data is held across many disparate applications each storing its own data. A typical CSP today can have as many as a hundred, sometimes more, separate databases that run their network, and the number is growing at 10 to 20 percent a year. Continuing with such a silo structure is unsustainable because adding applications simply escalates data duplication and network complexity until the whole thing becomes practically unmanageable. Not only is the cost of acquiring the data and managing it high, but the sheer complexity inhibits the CSP from making proper use of this superb asset. A recent survey of senior industry managers by Nokia Siemens Networks showed that over half the respondents cannot analyze customer behavior using their existing customer data infrastructure, while almost as many complained that data is not being analyzed fast enough. 83 percent of CSPs say that real time subscriber data is critical to improve the subscriber experience. Yet only 14 percent of CSPs have real-time data analysis available to them. If only CSPs could consolidate all the rich subscriber profile data they have, they would be well placed to take full advantage of their trusted relationships with subscribers. That’s where a unified real-time Subscriber Data Management (SDM) solution, with totally open interfaces and complete reliability, comes in. The benefits of such an SDM solution, where subscriber data is consolidated into a single database and accessed in real-time by multiple data-less applications translate into reduced costs, both operational and capital, better consistency of customer experience, and faster time to market for new services. 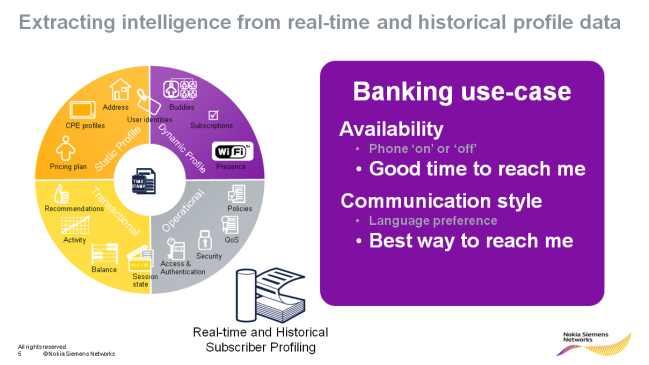 Better still, if CSPs can leverage this subscriber data in real-time they can not only improve their service offerings, but can also create completely new revenue streams and support third parties in numerous industry sectors in improving their service offerings to their customers. With such business transformation more value added services can be provided to banks, call centers and others on top of the packaging of minutes, messages and megabytes with their own products. Imagine a bank customer who is travelling abroad and attempts to use his credit card to make a purchase, but finds it is blocked. In these days of frequent fraud, banks are rightly sensitive about protecting their customers. But had the bank been able to access the subscriber’s roaming data, it would have known where he was, that it really was him attempting to use the card, and not cancelled his card. Not only would the customer enjoy a better service experience, but the bank would save the cost of issuing a new card and a month of lost income. Or consider the case of a roaming mobile subscriber also travelling abroad. He gets a sales call from his mobile CSP offering him a new data tariff. He is not happy because he is paying roaming charges to receive the call. Even the CSP seems unable to use its own subscriber data to recognize what a bad idea such a call is. Such examples are happening all the time today - in fact, they demonstrate that some of the first opportunities that validate the business case for Telco 2.0 are right here inside the telco itself, in improving its own operations, product development, marketing, and customer care. This can help to reduce costs, optimise CRM, and enable rapid service creation and deployment, even before we begin to draw in upstream customers, integrate new forms of content delivery, and extend our activities into the enterprise. With this consolidated overview of their subscriber profile data, plus real-time insight into customer behavior, CSPs can bring value to their subscribers, their own business and third party companies. More business potential lies in identity management. The Nokia Siemens Networks survey reveals that 64 percent of CSPs see identity management and managing multiple subscriber identities as a key issue. Identity management controls the provisioning, sign-on, linking, and federation of subscriber identity data to Internet services. As online business continues to grow, the issue of identity becomes increasingly thorny. Passwords proliferate and security details are requested by an ever growing number of service providers and content owners. New services, such as cloud computing, make the protection of personal details even more complex. The issue can be difficult for consumers, but a superb business opportunity for CSPs. And with many subscribers continuing to access Web 2.0 applications via PCs over fixed lines, this is one area that can benefit fixed-line providers as much as mobile CSPs. For subscribers, identity management means an end to the ever-growing numbers of passwords and logins, since they can be identified by their mobile device or IP address. With the CSP acting as a trusted partner and gateway to online services, all their online activities can be authenticated by a single device certificate or password. Another key to successfully becoming truly subscriber centric is to ensure data privacy. Surely users should be able to control their own data exposure. Permissions-based use of data should be rigorously adhered to. If users properly understand the benefits to them, a better service experience, with appropriate incentives they can choose with whom to share their data and for what purposes. The CSP must also take into account local regulatory constraints as well as local cultural influences. Different populations accept different levels of exposure of their personal data. For example, in some countries salaries are made available on websites as a matter of course, something which would be completely unacceptable in other countries. The possibilities for growth and efficiency that unlocking the potential of subscriber data enables are almost limitless. So, let’s get working on it. Find out more about Subscriber Data Management in this podcast at Nokia Siemens Networks, in which Paul Magelli, head of the Subscriber Data Management unit, discusses how to make smarter use of subscriber data.